Heat oven to 450°F. Bake pie crust as directed on box for One-Crust Baked Shell, using 9-inch glass pie plate. Cool completely on cooling rack. Meanwhile, in medium bowl, beat whipping cream with electric mixer on high speed until stiff peaks form. Set aside. In another medium bowl, beat cream cheese, peanut butter, marshmallow creme and icing sugar with electric mixer on medium speed until smooth; fold in whipped cream. Carefully spread into crust. 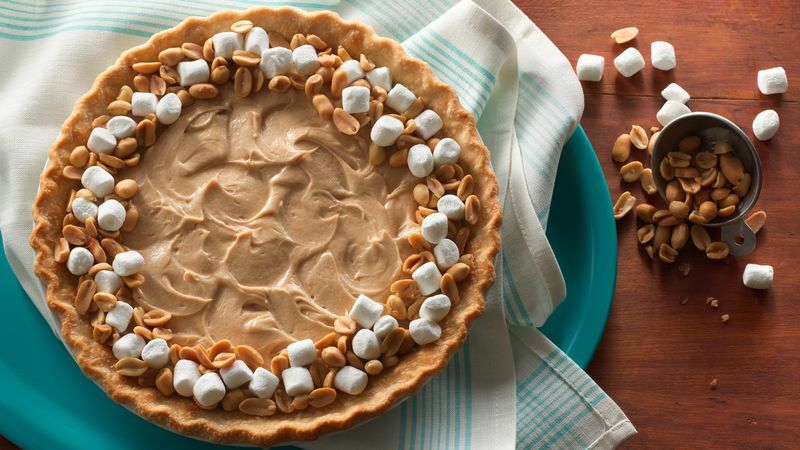 Sprinkle peanuts and marshmallows around edge of pie. Refrigerate until set, about 2 hours. Cover and refrigerate any remaining pie. Drizzle with caramel sauce just before serving.